Sleeping throughout the night can be a challenging task if you’re overheated. Traditional pillows can leave you feeling hot and uncomfortable. If you find yourself waking up at night to flip your pillow or get a glass of cold water, buying the best cooling pillow that stays cold might be for you. It can help you get cozy faster so resulting in less tossing and turning. Better sleep through the night can leave you feeling refreshed and ready to start your day. A good night’s sleep can lead to better moods, better weight control, and better overall health. According to a Harvard study, the quantity and quality of sleep you get can have a profound impact on learning and memory as well. Make sure those extra zzz’s count. 8. Cooling Gel Memory Foam by Product Shop, Inc.
What Firmness Do You Prefer? Material – What Type Do You Want? Cooling Gel Memory Foam Pillow by Product Shop, Inc.
Laniloha has created a pillow aimed at keeping you cool and refreshed all night long. Made with three layers of support including an inner pillow cover, cool gel insert and solid core memory foam leaving you well rested. The orthopedic design supports your head and can relieve even the most severe neck pain. The thick pillow is ideal for people who sleep on their side. Cooling gel inserts are becoming the next big item for people who prefer a cooling sensation when they sleep. It features a cooler insert that lasts longer than others on the market today. Its contoured design promotes airflow and heat displacement. Furthering the cooling effects of this pillow is a breathable bamboo viscose cover. Bamboo is both softer and cooler than its competition such as traditional cotton. The removable cover can be machine washed as needed. While the support it provides is great, the core memory foam may be too firm for some. If you are prone to night sweats or run throughout the night, you might want to consider this refreshing pillow to help you get through the evening. This firm, yet comfortable pillow is made from high-quality, breathable materials. It aids in airflow making you feel comfier during the night. You are more likely to wake up feeling well rested and refreshed when you switch to this one. Ideal for back and side sleepers. With an abundance of support for both head and neck, you will benefit from promoted spinal alignment over time. It is truly configured to eliminate aches and pains. The quality tested cooling gel is made of individual cells that work to keep you cool by dispersing heat. It is suited for those with sensitive skin or prone to allergies as well. 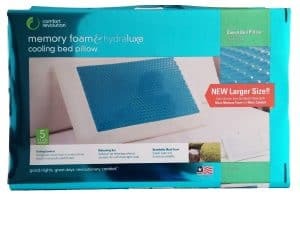 This memory foam cooling pillow is phthalate, lead, and BPA free. It is also dust mite resistant. Remove the machine washable cover and toss it in the laundry along with the rest of your bedding for a quick sanitation. Before use, you will need to give it some time to air out. Although harmless, the foam can give off a smell or scent that can be off-putting to some. You may want to consider this one if you are tired of waking up overheated during the night. A pillow that will truly provide you will a cooling sensation while you sleep. Between its dual-sided materials and design, this is a versatile pillow that will work for just about anyone. 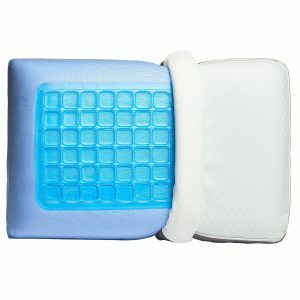 Whether you are a side, back, stomach, or somewhere in between, this 5-inch cooling gel pillow will work for you. One side features a medium-firm side, while the other is a medium-soft so you can adjust it to your needs at the time. Made with naturally hypoallergenic foam so that you can be assured your sleeping on only the best. Its technology promotes airflow and keeps you cool throughout the night. Best yet, it’s easy to clean. Simply remove the cover along with your sheets, toss it in the wash and replace. Due to the reversible nature of this pillow, it isn’t contoured to your neck. You won’t receive as much support from it as some others on the market. If you are on the hunt for a versatile designed pillow that will work for any sleeping position, this might be your best bet. A much cooler alternative to some of its competitors. This pillow is a side sleeper’s dream. Designed with a thick edge for support of your head so there is less strain on your neck which comes from sleeping on your side. The visco-elastic memory foam that this pillow is made from is lighter in weight and more plush than traditional memory foam. The Outlast Adaptive Material contains microscopic PCM beads that absorb heat and leave you feeling cooler. Completing the refreshing feel is a high-end 100 percent cotton cover. After about a year or so you will begin to notice that your pillow loses its firmness. If you are not looking to purchase a new one each year, this may not be for you. You might want to think about choosing this pillow if you are a side sleeper that needs head and neck support but hates the feeling of a super firm pillow. 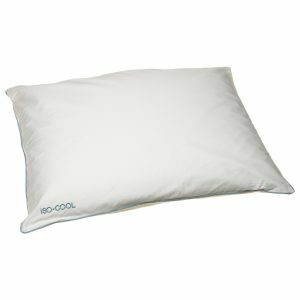 This hypoallergenic cooling pillow will help you get cozy quicker preventing you from tossing and turning all night. Made from a medium-soft memory foam to give you support while providing you with the comfort you desire. The dual-sided option allows you to create the ideal sleep temperature you desire. If you get too hot during the night, just flip it over for a more cooling effect. Unlike most cooling pillows, this one is made with gusset siding and ventilated holes making it great for side sleepers. However, the shape and design of this pillow will work for any sleeping position. This pillow is loaded with support. It reduces pressure on your neck by giving your head the support it needs. One drawback to this product is there are no actual cooling elements besides being well ventilated. Because of this, it is cooler than the average pillow but not the coolest on the market. You might want to consider this option if you are looking for a medium-soft pillow that is hypoallergenic. This thin pillow is a stomach sleepers dream. Made in the USA with hypoallergenic materials so you can get the best sleep possible. Shredded memory foam is the filler in this lightweight pillow. Shredded foam is much less dense, and cooler than traditional memory foam. The cover is made from a breathable micro-vented Kool-flow technology. It is 43 percent bamboo viscose which is a whole 4 degrees cooler than cotton. Designed to be durable you can toss it in the washer and dryer for a quick cleaning. It is guaranteed not to flatten over time. Your firm cooling memory foam pillow will arrive to you vacuum sealed for an eco-friendly shipment. It may take several hours fully decompress before you can use it. A big downside to shredded memory foam pillows is they can become lumpy over time. To get it back to its normal shape, its advised to toss it in the dryer for 10-15 minutes. However, the last thing you want in a cooling pillow is for it to come straight out of the dryer. 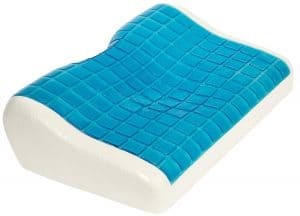 If you are looking for a pillow specifically designed for people who sleep on their stomachs or prefer thinner one in general, this might be the best product for you. A stackable pillow designed to give you a pain-free sleep while keeping your cool and relaxed. Your head will be held in place, so you toss and turn less throughout the night allowing you to wake up refreshed. The cooling gel promotes airflow and wicks away moisture giving you a cool sensation. If you sleep on your stomach, you may wake up with a cool cheek. Designed to be ergonomic so that it cradles your head in place whether you sleep on your back, side or stomach. The base was formed so that you can easily stack it on top of as many or little pillows you prefer without falling off. You will be able to create the perfect sleeping height just for your needs. For being only four inches thick, it is incredibly heavy. Weighing in at nearly 5 pounds, you are sure to win any pillow fight you find yourself in. You might want to consider this one if you are looking for something that will give you a cool sensation the entire night through. A highly contoured pillow that gives you the support you need while keeping your cool during the night. This small pillow cradles and molds to your body so you can get a relaxing night’s sleep. The cooling gel pad provides heat disbursement taking warmth away from your head. Ideal for side sleepers and back sleepers who need added structure to their pillows. Hypoallergenic for anyone suffering from allergies or sensitive skin. This firm pillow is also dust mite resistant and will last longer than most. Because it was designed to cradle your head, it is smaller than a standard size. If you prefer a larger one, you may want to keep looking. You might want to think about giving it a try if you haven’t found anything that can give you the intense support you need. Smuggle-Pedic has created an environmentally friendly product that works to keep you chill and comfortable all night long. This medium-soft pillow made in the USA can be beneficial to everyone regardless of their sleeping position. The lightweight shredded memory foam is cooler than traditional foam and machine washable. Simply toss the whole pillow in with a load of laundry when needed. 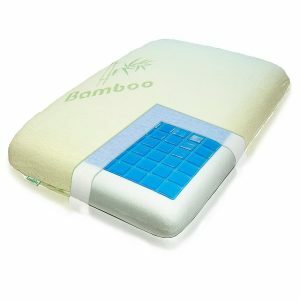 An extra breathable 43% bamboo cover completes this cooling pillow giving you a fresh feeling. 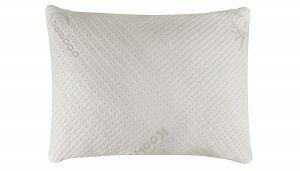 Not only is this pillow Certipur-US certified but it’s also Eco-friendly Biogreen certified. These certifications mean it was made with no ozone depleters, PBDE fire retardants, phthalates, mercury, lead or other heavy metals. This company is so environmentally conscious that the even ship it to your door in eco-friendly packaging. Although there are many great aspects to this pillow, it can be quite high maintenance. It will need to be fluffed often or tossed in the dryer to bring it back to life. You should think about this option if you are looking to buy one that was made by a company that cares about the world around them. 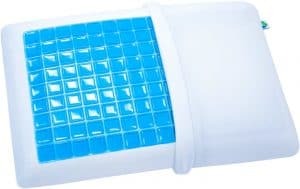 Truly the best that was designed to keep you cooler throughout the night than most pillows on the market. The hydraluxe gel technology enhances circulation so can wake up feeling refreshed and ready to go about your day. A breathable mesh cover traps moisture and heat as you sleep. 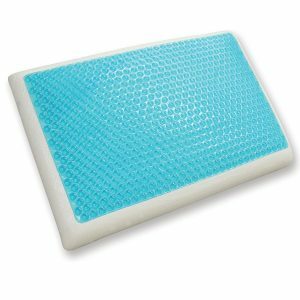 Finally, the cool cerulean gel bubbles create added cooling when you flip your pillow over. The softness of this pillow makes it perfect for side and back sleepers alike. You will have maintained support while the pillow conforms to your head, neck, and shoulders. Unfortunately, the cerulean bubbles can leave indents on your skin without the use of a pillowcase. However, even with placed inside a case, the cooling effect is still maintained. This option might be for you if you have trouble making it through an entire nights sleep because of the heat. Before going out and purchasing the first one you see, there are several factors you may want to think about first. Choosing the wrong one could result in a product that won’t work for you. Firmness in mattresses ranges from soft to extra firm. Determining which will give you the most support while maintaining comfort is the first step you should take. This decision alone will cut your options and make your final choice easier. So, how do you determine which firmness will work for you? Take a look at your sleep position to determine what firmness you need. Side Sleepers: The best firmness for this common sleeping position is firm to an extra firm pillow. Back Sleepers: A medium-firm pillow with a contoured grade is ideal for back sleepers. Stomach Sleepers: People who sleep on their stomach can benefit from a thin, soft pillow that will support their neck’s natural curve. Combination Sleepers: Look for a dual-sided pillow that varies in firmness. If you can’t find a multi-purpose pillow a medium-firm will suit your needs. Keep in mind that your preference should rule all. If you’re not comfortable with a recommended pillow, you won’t get a good nights rest. The two main styles of cooling pillows are made from memory foam. However, there can be a huge difference between memory foam and shredded memory foam. Let’s take a look at some of the advantages and disadvantages of both to help you determine what will work best for you. Traditional memory foam is by far the most popular choice when it comes to cooling pillows. It gives you the support you and is especially useful for people with neck and shoulder problems. When you lay on memory foam the heat from your body softens the material allowing you to sink into it, relieving pressure points. However, memory foam is much denser than its shredded counterpart, making it heavier. Memory foam can also leave you feeling warm which is not exactly what you are looking for in a cooling pillow. Shredded memory foam is becoming more and more popular with pillow manufacturers. It is much lighter weight than traditional memory foam. It also allows for better airflow, resulting in a cooler pillow. For the most part, shredded memory foam pillows can be tossed in the washing machine right along with the rest of your linen. Double check with your manufacturer’s care instructions beforehand. There are some downsides as well. Shredded foam might not provide as much support as you would think. Memory foam works best in a higher density. If you prefer a softer pillow, however, this might be the way to go. When looking for pillows that stay cool, there are a few features that could be beneficial to you. Take a look at some of the following features to determine which are vital to your next purchase and which you can live without. Compare your list to each potential pillow to find a product that will fit your needs and budget alike. Many of them are either completely machine washable or have removable covers that can be thrown in the wash. However, some are only able to be spot cleaned. Do your research to determine if your next purchase will be easy to clean. A reversible design will allow you to have two different options throughout the night. You may prefer one side for sitting up in bed with a book and another for giving you support while you sleep. Dual-sided options are also convenient for sleepers who change position during the night. 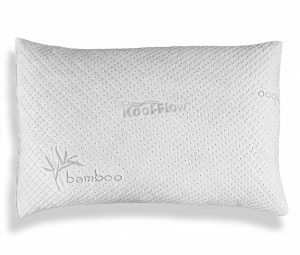 Fabrics that have insulating properties such as bamboo can create a much cooler pillow even without the addition of a cooling pad. Because the bamboo plant is highly water absorbent, it has a good amount of wicking properties to help keep you cool as well. Choose one that has ventilation on the cover as well as the sides. Many of the best ones will be ventilated only on the top and bottom sections. With the large variety of cooling pillows emerging on the market these days, it can be tough sorting through them all. Everyone has a unique sleeping pattern and different requirements. The best cooling pillow for you may be entirely different for someone else. 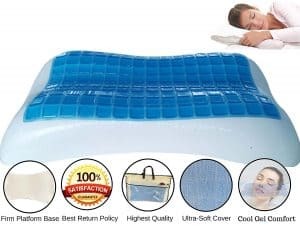 Hopefully, with the help of our cooling pillow reviews and buying guide, you will have a better idea of what you are looking for when choosing the best cooling pillow that stays cool all night, especially if you have hot flashes or night sweats. After doing a bit of research, you should be able to find exactly what will work for your needs and budget. Senseireviews.com is a participant in the Amazon Services LLC Associates Program, an affiliate advertising program designed to provide a means for sites to earn advertising fees by advertising and linking to amazon.com. FTC Required Website Disclosure – You should assume that the Owner of this Website has an affiliate relationship and/or another material connection to the providers of goods and services mentioned in this website and may be compensated when you purchase from a provider. You should always perform due diligence before buying goods or services online. The Owner does not accept payment or merchandise in exchange for the reviews themselves. They are written objectively and with honesty.